The Twins returned Friday from Thursday's offday with a reshuffled rotation. Tommy Milone got bounced to the bullpen, and Alex Meyer is to start Tuesday. Then Meyer pitched in relief Friday and didn't fare well -- one inning, five hits, two runs, a walk and a wild pitch. Inasmuch as he hadn't worked in nine days, that was probably to be expected. The Tuesday start is still his. The Twins will close out April with two members of the starting rotation that opened the season still standing -- Phil Hughes and Ricky Nolasco. It sounds like Ervin Santana will return late next week (he's to test his back with a bullpen session today), and that Kyle Gibson won't be ready to return when eligible to come off the disabled list.. The odds are that one of the three additions to the rotation -- J.O. Barrios, Tyler Duffey and Meyer -- is likely to get moved back to Rochester if/when Santana returns. That is based on the notion that there are no bullpen changes, and that notion may be misplaced. The Twins had Meyer starting in Rochester, and he did well in in 17.1 innings -- 19 strikeouts, just two walks, 1.04 ERA -- but that probably only sharpens the debate over whether the big guy is better suited to the bullpen or the rotation. Paul Molitor was in the bullpen camp when Meyer was sent down in March. Where Mollie will be if Meyer shines on Tuesday, who knows? So it's Duffey today, Nolasco Sunday, Barrios Monday, Meyer Tuesday, Hughes Wednesday, an off day Thursday and ... well, maybe Santana on Friday, and get ready to shuffle. One of the younger guys will be dislodged when Santana returns, another when Gibson does. It would be nice if they pitch well enough to make Molitor squirm when they go back to Rochester, but I'm not counting on it. Murphy's catcher ERA -- the team ERA when he's behind the plate -- is 2.71. Kurt Suzuki's catcher ERA is 4.67. There's a lot of noise in that stat, and not a lot of innings. But if that persists over time, it will suggest that he's doing something right behind the plate -- something that isn't real obvious. Walter Johnson might be the best pitcher in MLB history. Is Doc Hamann the worst ever? https://t.co/p8gt2uk8mT Good case for it. And as Buster Olney suggests, Hamann wasn't very good: one game with the Cleveland Indians in 1922, in which he got no outs, walked three men, allowed three hits, hit a batter, threw a wild pitch and allowed six runs for an ERA of infinity. Which still makes him a better pitcher than me. The BR page contains a link to a short bio of Hamann. Former Twin Chris Colabello tested positive for a steroid and has been suspended 80 games. Colabello says he didn't knowingly take a banned substance, and I'd like to believe him on that, but it ultimately doesn't matter. Colabello was an easy guy to root for even when I doubted that the Twins had a use for him, and I'm sorry to see him get derailed like this. Meanwhile, Reynoldo Rodriguez, a Triple A player for the Twins -- I saw him play in a spring training game in Fort Myers in early March -- got nailed as well. Eight games for him too. Last year he was the MVP for the Rochester Red Wings. This year, it's safe to say, not so much. Addendum: Between the time I wrote the above and the time I got up, MLB announced that Dee Gordon, Miami's All-Star second baseman, had been suspended 80 games for PED use. The 1 a.m. hour Eastern time is an odd time to issue suspensions, but I don't run the commissioner's office. Gordon, of course, is the brother of Twins shortstop prospect Nick Gordon (and son of former pitcher Tom "Flash" Gordon). Let's avoid the guilt-by-association thing here. I mean, one Thoma boy votes Republican, another votes Democratic and neither has any influence on the third. The Twins' Tyler Duffey is one of five pre-arbitration MLB players who has sold a percentage of his future earnings to a company called Fantex, which in turn intends to sell securities to investors. In Duffey's case, he's to get $2.23 million now in exchange for 10 percent of his "future on- and off-field cash flows." Of the six baseball players named in the linked Associated Press story, Duffey is getting the smallest amount. Jonathan Schoop, Baltimore second baseman, is the highest; he will get $4.91 million for 10 percent of his future earnings. Fantex also announced deals with one NFL player and four golfers and is still devising the securities it intends to market to investors. I am probably not their target market, and I'm not particularly eager to buy player futures with my retirement savings. I am, however, intrigued by the decision of these athletes to sell a substantial portion of their future for cash upfront. My reading of the story is that these deals have yet to kick in, so presumably Duffey has neither received his payment nor started to give up 10 percent of his salary. But essentially Fantex and Duffey are wagering on whether he tops $22.3 million in career earnings. If Duffey turns into Boof Bonser, he gets $2.23 million and Fantex gets, presumably, less than $200,000; if Duffey matches Ricky Nolasco's career earnings (counting what Nolasco is to get during his current contract), Fantex gets 10 percent of some $85 million, which is a pretty nice profit. Duffey now, presumably, has the freedom to turn down such an offer from the Twins, should the Twins be inclined to make such an offer. The Twins put not one but two starting pitchers -- Ervin Santana and Kyle Gibson, the men who held the No. 1 and No. 2 rotation slots to open the season -- on the disabled list Tuesday. And so it is that today Jose Barrios is to make his much-awaited major league debut, weather permitting. This is a good time to remember why the Twins are loathe to discard veteran starters. Pitchers get hurt. Jeff Passan, in "The Arm" -- a book I discussed in the Monday print column -- says half of major league pitchers go on the disabled list each year. It's still April, and the Twins now have three key members of their staff on the DL (the third being Glen Perkins). So Tyler Duffey and Berrios, left off the rotation at the start of April, will be in the rotation when May begins. And had the Twins discarded Ricky Nolasco -- an unlikely move, but one that would have satisfied many fans -- at the end of spring training, they would today be reaching deeper into their farm system for an arm. Berrios ... I have seen him pitch three times in person. The most extensive outing was in 2013, late in the season for Cedar Rapids in the low A Midwest League. 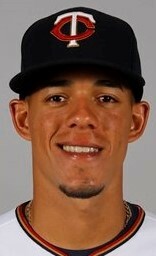 That was Berrios's least-impressive stat line in the minors, and he was so-so in that outing. The second time was his one-inning start in the 2014 Futures Game in Target Field (so at least he's been on this mound before). Impressive, but just three batters. And the third was his spring training debut this spring in Fort Myers, when he was reportedly nervous and obviously wild. I have no real idea of what to expect from him in his debut. He's a better pitcher today than when I saw in Iowa three summers ago, certainly. The talent is there. How much the excitement of making his major league debut will affect his work is probably the single biggest variable. Also called up Tuesday was infielder Jorge Polanco, who gives the Twins a third position player on the bench. He probably won't play much, but his presence provides a bit more balance to the roster. As expected, the Twins made several moves Monday, but not all the moves they intended. Utility man Danny Santana was brought off the disabled list; he started in center field, hit ninth, went 1-for-3 and had no misadventures in the field. Demoted were the two best center fielders on the roster, Byron Buxton and Max Kepler. The outfielding chores will presumably be split up among Miguel Sano, Santana, Oswaldo Arcia and Eddie Rosario, with Santana and Rosario being the center field options. This is probably the best offensive group of four outfielders the Twins can concoct out of their 40-man roster, and pretty close to the weakest defensively (Adam Brett Walker is on the 40). Any outfield with Sano and Arcia in the corners does the pitching staff no favors. Buxton has been overmatched in a majority of his at-bats, and Kepler has barely played since spring training, so there is a good argument for their demotions; I still prefer having one of them in center on a regular basis. But at least David Murphy partially spared the Twins from themselves. The day after the Twins lost catcher John Hicks on waivers -- a move Terry Ryan said Monday was made to clear a roster spot for Murphy -- the veteran decided he would rather go home to his family, and the Twins released him Monday. I wouldn't trade a 26-year-old optionable catcher for Murphy, but the Twins handed Hicks over to the Tigers in order to activate him. Now they have neither Hicks nor Murphy. At least the roster isn't cluttered with a 34-year-old fading corner outfielder. 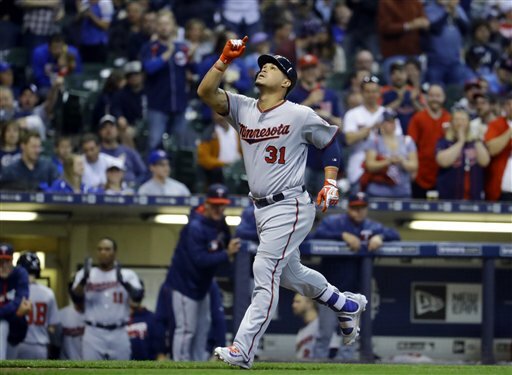 If the Twins aren't going to give at-bats to Buxton and Kepler, they should at least give them to Arcia and Rosario; they might amount to something. More moves should be expected soon. The Twins have 14 pitchers active and just 11 position players. Monday's bench was Rosario and John Ryan Murphy. That's not a sustainable situation. But ... they can't send down Tyler Duffey (bruised right shoulder) until he's cleared to pitch, and they don't want to put him on the DL. They don't want to put Ervin Santana on the DL either. And apparently they don't want to waive Michael Tonkin (out of options), even though he has a much better chance to clear waivers than Hicks did, and they are loathe to punish Ryan O'Rourke for his impressive outing Sunday by kicking him to Rochester. They have individual reasons not to make a move with any of those four, and an overall reason why they must with at least one of them. John Ryan Murphy had another disaster of a game Sunday. The Twins' No. 2 catcher was 1-for-6 at the plate, was unable to stop a bounced curve in a key situation (Trevor May's eighth-inning wild pitch) and, of course, committed the two-out throwing error in the bottom of the 15th that allowed Washington to extend the game to the 16th, when they won. I predicted at the start of the season that Murphy would eventually supplant Kurt Suzuki as the regular catcher. Off what we've seen so far, it's incredible that he made it through the entire 2015 season with the Yankees. He's got to be a better player than this, but we aren't seeing it. Murphy's hitting .094 with a .246 OPS -- that's on-base plus slugging, not his on-base percentage. In 79.2 innings caught, he has been victimized for seven wild pitches and one passed ball. Suzuki has 90.2 innings with no passed balls and four wild pitches. Suzuki hasn't hit much either, but he's in no danger of losing his job to Murphy. Assuming that Murphy has an option left, it might seem logical to move him to Rochester, but earlier in the weekend the Twins inexplicably waived John Hicks, the third catcher on the 40-man roster. He was snatched up by Detroit. The Twins presumably wanted the 40-man spot for a non-roster guy they want to call up, but they didn't make an immediate move. I find it difficult to believe they thought they could slip a decent defensive catcher with options through waivers. I also doubt that they'll try to create another 40-man opening so they can add Juan Centeno or some other catcher. Murphy is staying. But there certainly will be roster moves today after that disaster of a weekend in Washington. 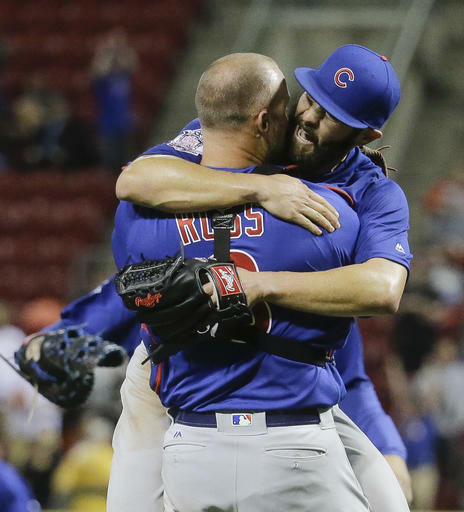 In his last 24 starts, dating back to last season, Jake Arrieta has thrown 178 innings (7.4 per start), allowing 91 hits and 33 walks with 173 strikeouts. His ERA in that span: 0.84.
home run Friday in Washington. Miguel Sano had two hits, including a home run, on Friday. In his last nine games he has lifted his batting average from .125 to .263 and his home run total from 0 to 3. This is hardly a novel concept: It's a lot easier to live with Sano's shoddy fielding in right when he's being a force at the plate than when he isn't. For eight games he gave the Twins almost nothing at the plate. That has changed. Sano's re-emergence as a hitter is particularly important right now because the Twins are in their longest no-DH stretch of the season, five games. No DH effectively means either Joe Mauer or Byung Ho Park has to be out of the lineup. And with the usual cleanup hitter, Trevor Plouffe, sidelined, the lineup is further thinned. Paul Molitor is reluctant to move Sano back to third while Plouffe is out, and I agree. Sano was regarded as a weak third baseman as a minor leaguer, and he hadn't worked at the position since leaving winter ball until Plouffe went down and the Twins were temporarily without a reserve infielder. Yes, Sano has more experience at the hot corner than in the outfield, but the evidence that he's got a true defensive position is more slender than Byron Buxton. It is reasonable for the Twins to believe that Sano has to regard himself as an outfielder for his current position to take hold. Shuffling him back and forth isn't going to hasten the process. Yeah, the Twins won Thursday, and certain important hitters in their lineup -- Miguel Sano, Eddie Rosario -- are showing signs of life. I barely noticed, and that's true of a lot of people, Minnesotans and otherwise. The reaction to the sudden death of Prince intrigues me. 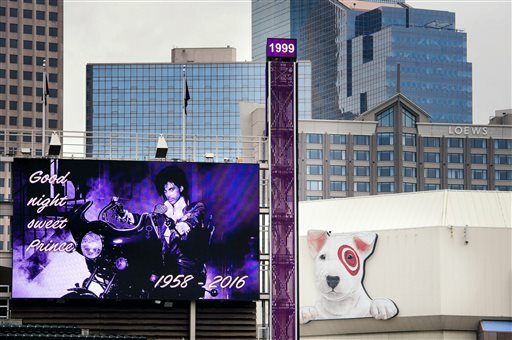 It's been a while since he was a major commercial force in popular music, And still -- buildings and bridges and other structures around the world were bathed in purple light Thursday night in his honor, and the crowd that descended on the west end of downtown Minneapolis speaks to the connection Prince and his hometown shared. First Ave. isn't far from Target Field; it's a good thing the Twins were on the road. Most spot-on Joe Mauer quote ever: "It's sad news. Any Minnesotan takes credit for Prince, for sure." There may not be anybody more qualified than Mauer to describe (and identify with) the weird blend of pride and contempt Minnesotans have for the Minnesotans who make it on a national scale. Prince Fielder is named for the singer. "U Got the Look" contains the line: "Boy versus girl in the World Series of love." I've always connected that line to the Twins 1987 World Series win, but the song was recorded before that season began. Alex Rodriguez on Thursday used "Kiss" as his walkup, which is amusing because of the famous photo a few years ago of ARod kissing his reflection in the mirror. Rodriguez is not exactly known for his self-awareness, but I have to doubt that selection was accidental. gave away with his glove defensively. Long-time readers of this corner of cyberspace know that I believe that the quickest way to improve a bad pitching staff is to improve the outfield defense. An outfield with both Oswaldo Arcia and Miguel Sano, I believe, is too heavy a burden for the Twins pitching staff to carry. I recognize the tradeoff involved. Teams need to score some runs, and corner outfielders are expected to produce at the plate. That, at least, Arcia has done in his limited playing time. Sano, not so much. 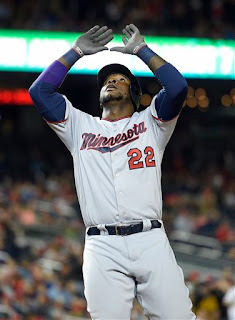 On Tuesday it was Sano whiffing on a catchable ball for an error and misplaying a catchable ball at the wall for a "double" that had Ervin Santana gesturing in frustration. On Wednesday it was Arcia failing to cut off a single for an error and allowing a fly ball to land on the warning track for another "double." Somebody has to catch the ball in the outfield and keep the pitchers in the game. The Twins can probably live with one butcher in an outfield corner. They cannot contend with two of them. Between Miguel Sano's butchery in right field and John Ryan Murphy's inability to corral Ervin Santana's pitches, the Twins deserved to lose Tuesday's game, and they did. Sano's problems were expected. Murphy's, less so. Santana was charged with two wild pitches Tuesday, Ryan O'Rourke one, and Murphy was charged with a passed ball. That's four pitches that got away in one game -- and seven in six games caught for Murphy, a truly awful rate. I predicted earlier that Murphy would eventually take the starting job away from Kurt Suzuki. So far he has neither hit nor caught well enough to push the veteran. Trevor Plouffe was put on the disabled list Tuesday and Jorge Polanco called up. As with Max Kepler, it may not be ideal to have a top prospect sitting on the major league bench, but the Twins don't have an opening on the 40-man roster and aren't going to lop someone to make a temporary move. As matters stand, Polanco's future with the Twins may be as a utility guy anyway. I don't believe he has the arm for the left side of the infield, and Brian Dozier is rather locked in at second base. Adventures in Baseball Reference sponsorships time: I picked up Byung Ho Park's page about five minutes after his homer into the center field bar on Saturday. Park Bang, baby! 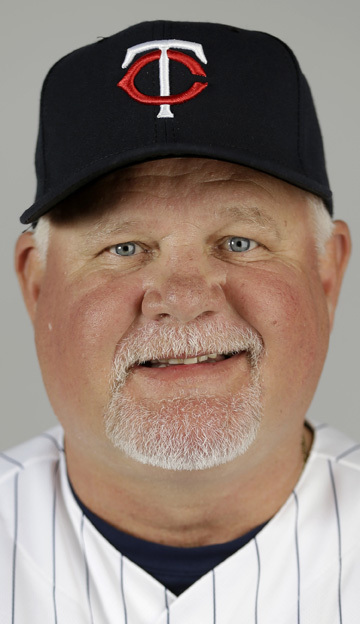 Ron Gardenhire spent last season getting paid not to manage and hoping to land a dugout job for this year. The latter didn't happen, and the former ended. On Monday the Twins announced that Gardy will be a special assistant to the general manager, a role that will involve touring the minor league affiliates for instruction and evaluation, plus some major league scouting. This is basically the role Tom Kelly has played for years, but Gardenhire's dugout predecessor apparently has decided to cut back on the travel, which is understandable. I've no problem with the instruction role of Gardenhire's new job. The scouting and evaluation portion, I'm not so sure about. My sense of his lengthy managerial tenure is that evaluation was one of his weaker points. 2005-06: With shortstop Cristian Guzman departed, Gardenhire persisted in playing veteran Juan Castro and found (or invented) reasons to sit Jason Bartlett. This only ended when Terry Ryan released third baseman Tony Batista and sold Castro, giving Gardy really no other option. Early 2009: I remember a piece in one of the metros in which Gardenhire bragged that pitching coach Rick Anderson wanted Glen Perkins to be a relief pitcher, but Gardy knew that Perkins was a starter. Turned out Anderson had the better handle on Perkins. Late 2009: Gardenhire buried Carlos Gomez, deciding that Delmon Young was the better player. Even in September, with Justin Morneau sidelined by his fractured vertebra, Gardy filled the lineup hole with a platoon of Brendan Harris and Jose Morales at DH (which moved Jason Kubel to right and Michael Cuddyer to first). Today, of course, Gomez is a two-time All-Star and lineup fixture, while Young is out of the game. 2014: The Twins opened the season with Kubel and Bartlett on the 25-man roster, even though both appeared practically useless in spring training. There are other questionable evaluations that I don't think can be blamed on Gardenhire as directly as these. All told, this is not a track record that makes me believe I want Gardy having a major voice in deciding, for example, which of Oswaldo Arcia, Max Kepler and Eddie Rosario should be the long-term left fielder. by Miguel Sano and Eddie Rosario after Arcia's game-winner. * The late-inning bullpen work was part of the problem in the nine-game losing streak that opened the Twins season. But on Sunday Kevin Jepsen and Trevor May had strong one-inning outings, and Casey Fien/Ryan O'Rourke combined for a hitless inning. Perhaps the revelation was Michael Tonkin, who overpowered Mike Trout and Albert Pujols (and others) in his two-innings stint. Tonkin essentially made the roster out of camp because he was out of options. Sunday was just his third outing, and he looked, for once, like a pitcher who could dominate the International League (which he did last season). I'm not forecasting an immediate role promotion for Tonkin. But what I've long called the Greg McMichael Rule always applies: Get outs and theyll find a role for you. Well, yeah. I was ready to discard Arcia during the offseason. And, to be blunt, it takes more than a good weekend to discard the label I'd put on him from three seasons' exposure. Maybe he's figured it out. And maybe he'll revert to the pull-happy defensive butcher he's been in the past. The Twins have plenty of outfielders to pick from. Arcia this weekend put himself back in the running for playing time. * Trevor Plouffe left the game with what was deemed a strained intercostal muscle. Supposedly he's day-to-day, but these things have a tendency to linger. Whether Plouffe is out two games or two weeks, do not expect Miguel Sano to start at third. The big guy hasn't taken grounders there since winter ball. He's an outfielder now. I'm not saying he's a good outfielder now, but he wasn't a good third baseman either, and the Twins are not going to yo-yo him back and forth. Here's an issue, however: if Plouffe stays on the active roster but can't play, there Twins now have no backup infielder. Presumably Eduardo Nunez will play third, but the four-man bench will be Plouffe, the backup catcher and two outfielders. Sano and Eddie Rosario have infield experience. If something happens, somebody will have to play second or third. Thursday's loss to the White Sox. 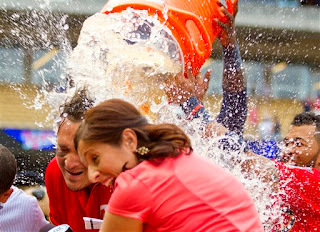 Since that photo was made, the Twins have won a pair of games, and Plouffe had no small role in those wins. He scored the winning run on Friday, dashing from first base on Byung Ho Park's double, and was 3-for-4 with a home run and a double on Saturday. short right field. Somehow, nobody was hurt. It wasn't a particularly elegant W, but the Twins aren't complaining about it. *Byung Ho Park doubled on Thursday. He doubled again Friday to bring home the winning run. He's certainly had his struggles -- as has every hitter on the roster other than Joe Mauer and the the Eduardos, Escobar and Nunez -- but it's too early to write him off. Remember, this was always expected to involve a learning curve. Fangraphs posted this piece on Park's struggles on Thursday. * The Miguel Sano-Eduardo Nunez collision in right field looked worse than it was. Here again, the Sano project was always expected to involve a learning curve. In this case, though, there's a pretty good chance of somebody getting hurt if Sano is going to forego calling for balls in short right. * Down in Rochester, Alex Meyer three six shutout innings without a walk. That's a good sign. Considering the shaky, if scoreless, outings by the back end of the Twins bullpen Friday and their previous struggles, any indication of possible help is welcome. this spring after splitting 2015 between Cleveland and Anaheim. At the end of the weekend series in Kansas City, Paul Molitor said the Twins' 0-6 record "stares you in the face." Since then the Twins have lost three more games while scoring a total of two runs. An 0-9 record doesn't blink either. 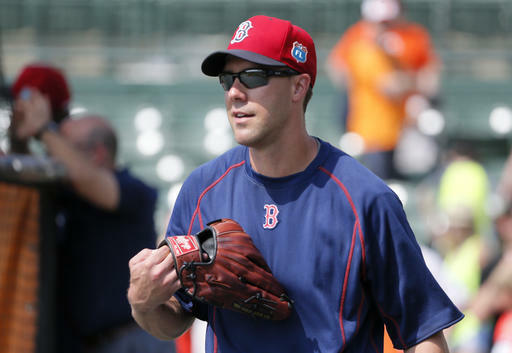 The Twins on Thursday morning announced the signing of David Murphy to a minor league contract. Murphy is a 34-year-old left-handed hitting outfielder with 10 major league seasons on his resume, mostly with Texas. He was in spring training with the Red Sox and cut loose at the end of training camp. Murphy is to report to the Rochester Red Wings, and the general expectation is that he will not be long for Triple A, that he will be quickly called up to the big club. If that happens, it fits my conception of a panic move, a move to do something regardless of whether it makes sense. Oh and nine can do that to an organization. Oh and nine can rob it of its confidence and certainty. Oh and nine can make it at least temporarily irrational, if not insane. Terry Ryan and his colleagues decided this winter that an outfield of Eddie Rosario, Byron Buxton, Miguel Sano, Oswaldo Arcia and Danny Santana is good enough to contend. Are they really ready to declare that plan defunct less than two weeks in? And if so, are they really going to try to fix it with a player a decade older than any of that fivesome, much less Max Kepler? It's possible that Rosario's plate discipline issues have indeed become too great a problem and have undermined his talent. Fine, demote him. But don't waste those at bats on Murphy. Give them to Arcia. Or Kepler. Glen Perkins went on the disabled list Wednesday with what was described as a "strain" in the back of his throwing shoulder. I wish this was a surprise, but one could see it coming pretty much all spring. Perkins never displayed his usual velocity during training camp, and everybody kept shrugging it off. Joe Nathan never had his velocity during spring training, and he was always fine once the season started. And then the season started for Perkins, and the fastball stayed in the low 90s, and that's not enough for a two-pitch reliever. I won't pretend to know what Perkins' outlook is now. Shoulders are tricky things, all these fragile little muscles that give the human arm such remarkable range of motion and make it possible for well-trained and talented hurlers to throw baseballs upwards of 100 mph. And when something gives way in the shoulder, surgery is seldom a useful option. So much of the Twins bullpen plan was based on Perkins being Perkins once again as the endgame. Now presumably Kevin Jepsen and Trevor May and Casey Fien move up one notch apiece in the late inning corps, and none of them have been anying resembling useful so far this season. The Twins are, of course, 0-8, and the obvious big issue is the hitting. The Twins have scored just 13 runs in those eight games. But the late inning guys in the bullpen have been a problem as well. It is, by definition, a small sample size, but it's difficult to be patient with anybody, even a short reliever, when you're 0-8. Want to see a man break his arm throwing a pitch? Really? Then click here. Dan Winkler is 26. The Braves took him as a Rule 5 selection two offseasons ago but he basically missed 2015 while rehabbing from Tommy John surgery. On Sunday he fractured his elbow while pitching to the St. Louis Cardinals. It wouldn't surprise me if he doesn't pitch again this year; it wouldn't surprise me if he never pitches again. But the others ... think of the pitching motion as a chain of events. Chains famously break at their weakest link. Often that's the small muscles of the shoulder. Sometimes it's the ulnar collateral ligament, the UCL of Tommy John surgery fame -- which, obviously, already broke once for Winkler. It's incredible to me to imagine the weak link being a bone. Man, pitching is rough work. Browning returned from his injury to pitch in two more games before retiring. Smiley (who pitched for the Twins in 1992), Zumaya, Dravecky and Saunders never pitched again in the majors. So the track record of returning from this kind of thing isn't good. Trevor Plouffe late in the game. I said during my belated KMSU appearance, recorded Monday morning because I was to be on the road at air time, that I felt better about this team's 0-6 coming into the home opener than I did about 2015's 1-5 because in 2015 the Twins were being consistently blown out in those initial games. This year only one game has been one-sided. And that was the case again on a chilly Monday afternoon at Target Field. 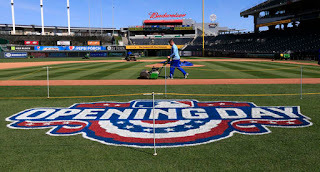 The Twins lost 4-1; last year's score for the home opener was 12-3. Progress, folks! At some point you are what your record says you are. I don't believe that's the case for the Twins yet. * Kyle Gibson wasn't particularly sharp, but he allowed just one earned run in his 5.2 innings. (The two-run fourth opened with Eduardo Escobar bouncing a routine throw past Joe Mauer for an error, and the runs scored with two outs.) With 40-degree temperatures and 100-plus pitches, I was a little surprised Gibson got as far as he did. * I was even more surprised that Ryan Pressly went 2.1 innings. I suggested in that KMSU appearance that he might be in line to move up the bullpen ladder a notch. He didn't hurt his cause Monday. although the actual use suggests more of a long-man role than a short relief one. One of the two baserunners beat out, with the help of replay, a soft grounder to second that Brian Dozier had some trouble getting a grip on to throw. *The Twins only struck out seven times, which is their new season low. And Eddie Rosario actually walked, which astounded me in the left-field seats. * Miguel Sano didn't look terrible from my vantage point, which wasn't good for evaluating the right fielder.He did make an odd-looking throw to third base with a skipping motion that is, I'm sure, a remnant from his infield days. I will wager that Butch Davis, the coach responsible for the outfielders, either talked to him about that technique or will. * There were boos at the end of the game for 0-7; there were boos also when third base coach Gene Glynn held up Joe Mauer at third base on a short fly to center. I would have held Mauer in that situation too. No sense in risking the out for a run that still leaves you behind. Danny Santana did something to his hamstring Saturday night, something significant enough that he was placed on the 15-day disabled list before the game ended. Max Kepler was recalled. In many ways, the selection of Kepler to take Santana's role is inappropriate. Santana is supposed to be the Swiss Army knife -- three infield positions, three outfield positions. Kepler can handle the outfield spots at least as well as Santana, but he's no infielder (other than first base, which is pretty well stocked). Kepler is talented but raw; he's a future regular, if not a future star, and nurturing that future requires regular playing time, not sitting on the bench in the majors. No, the debateable part of the call-up is this: Do you want an outfielder or an infielder to fill in for Santana? If an infielder, the obvious choice (again, because he's on the 40) is Jorge Polanco. The Twins went with the outfielder, from which we can surmise that the most important role Santana plays on this roster is that of speedy outfielder. Santana is (was) the defensive sub for Miguel Sano in right and the alternative to Byron Buxton in center. These are things Oswaldo Arcia, also on the active roster, cannot do adequately. Kepler can, even if using him for those roles isn't the ideal way to use him. The long held tradition was that the very first pitch of the major league season was scheduled for Cincinnati -- this on the basis that the Queen City was the home of the first avowedly professional team. Cincy's opening day parade was an annual highlight in that city. 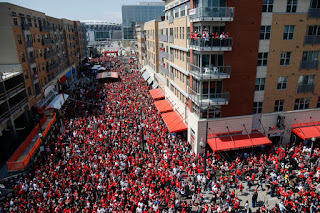 That tradition has been done away with by Major League Baseball; the Reds opened their season on Monday, and there were games played on Sunday. The interest of television -- ESPN gets an extra Sunday Night Game this way, often with the World Series champ (this year with both World Series teams, by coincidence) -- trumps tradition. Which is, to an old guy like me, a sorry thing. Byung Ho Park parked one Friday night for his first official major league home run, a 417-foot shot into a stiff wind in a very difficult power venue. I'd like to say he got it off a quality pitcher, but I'm not sure that Joakim Soria qualifies as such these days. The former All Star was great before the injury that cost him the 2012 season, and last year he had a deceptively good ERA and 24 saves, but after watching him in a couple of televised games I have my doubts that he'll long retain the eighth inning role in Kansas City. It's an interesting slash line Park has built in three major league games. Interesting but insignificant, given that it's all of 12 plate appearances and nine official at-bats: .222/.417/.556. If he does that all year, it's a bargain for the Twins. Paul Molitor made his first lineup changes of the season for the third game, and they were interesting both because of the potential matchup advantages and because of what happened in the previous game. On Wednesday Miguel Sano had some adventures in right field; on Thursday Sano was the designated hitter and Danny Santana was in right. On Wednesday Byung Ho Park struck out three times in three official at-bats (he also walked); on Thursday he sat. One of the questions regarding Park's transition to American baseball was how well he would handle velocity. Ubaldo Jiminez, the Baltimore starter on Thursday, has a notable fastball. So Molitor picked a matchup with Jiminez to get somebody else in the lineup. And the Twins starter on Thursday, Phil Hughes, is a rather extreme flyball pitcher. So Santana, the third best defensive outfielder on the active roster (behind Byron Buxton and Eddie Rosario) got the start ahead of Oswaldo Arcia. These are hardly permanent changes. But it's likely that Sano's outfield breaks will come heavily on days that Hughes starts. And maybe Thursday suggests that Molitor is looking to "protect" Park more than he suggested late in spring training. Miguel Sano had himself a moment in right field Wednesday night, turning a single into an RBI double with an ill-timed dive that was not only short but more than an arms length from the ball. Almost immediately I saw predictions in my Twitter feed that this "experiment" will soon end and declarations that it must. Inure your eyes to the ugliness, folks. Sano in the outfield is an organizational decision. Crucial parts of the lineup are shaped around that decision. It ain't changing. Sano is obviously a poor outfielder. 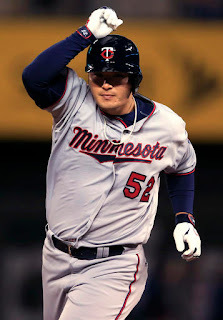 Over the past decade, the Twins have paraded the likes of Josh Willingham, Michael Cuddyer, Delmon Young, Oswaldo Arcia and Jason Kubel as full-time or nearly full time outfielders, Sano is faster than any of those five and throws better than all except perhaps Cuddyer. He's just inexperienced. And moments such as that ill-advised dive is how he gets that experience. 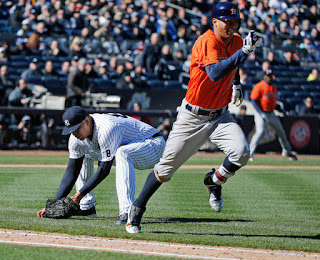 Old rule, Astros-Yankees: Houston's Carlos Correa, running to first base, runs well inside the baseline. 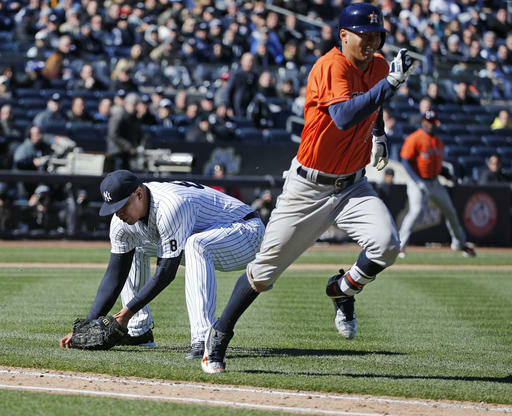 Yankees pitcher Dellin Betances, trying to throw the ball past Correa, throws it into the outfield, The go-ahead runs scores, and Houston wins the game. (Quote from the Daily News story on the play.) It's akin to the interference noncall in a Red Sox-A's playoff series a few years ago. A Red Sox fielder got in Miguel Tejada's way; they bumped; Tejada jogged home and was thrown out, and the umps' ruling was that Tejada's lackadasical effort meant that he would have been thrown out regardless of the bump. You gotta be trying to make the play to get the call. 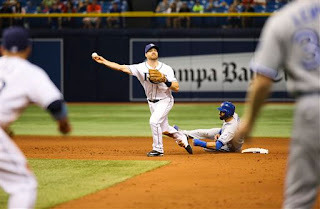 New rule, Blue Jays-Rays: Tampa Bay tries to turn a game-ending double play, Base-runner Jose Bautista reaches out to grab at pivot man Logan Forsythe's back foot, and Forsythe throws the ball away, Two runs score. The Rays challenge the call, and the video crew in New York deem Bautista to have violated the Chase Utley rule. The play becomes a double play, the runs are taken off the board, and the Rays win. The swipe at Forsythe's foot probably counts as changing the route for the purpose of making contact, which is expressly forbidden in the rewritten 6.01 (j). The field umpires said they had been instructed to limit their comments on the play to what the replay center told them. Presumably they aren't all that happy with the ruling either. But that's where all this started, with the umpires' collective unwillingness to make the judgment call the rule book granted them. Now the rule is specific and explicit. Bautista violated it. 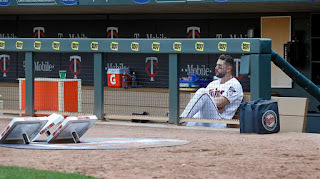 I wrote here Monday about what I see as the single largest issue for the Twins this season: Will they have enough baserunners to make their power effective? That certainly showed in the opener Monday. The Twins had seven hits in a rainy, windy game in Baltimore.Seven hits and no walks. The Orioles not only had 10 hits, they had five walks. Neither team hit a homer, and that doesn't figure to happen often for either squad. * Miguel Sano looked competent on his plays in right field. No matter the conditions, competent probably exceeds expectations, so I'll certainly take it. I predicted the Twins would set a franchise record for strikeouts. Didn't expect them to try to set it in the opener. * Bert Blyleven did little broadcasting from spring training, but he's already in midseason Bert form. This is not a complement. He had a nonsensical "cat-like instincts" for a Byron Buxton play Monday that I have to figure he uttered because he couldn't think of anything else to say. And Blyleven remains oddly fixated on the notion that Ryan Pressly should be a starter. Been there, done that; the Red Sox exposed Pressly in the Rule 5 draft because he had failed as a starter and they figured they could afford to lose a relief prospect. A little housekeeping for those of you who know that I have for two years been making biweekly appearances on Jim Gullickson's KMSU show: It's shifting from Mondays to Thursdays this year, and my first exposure will be this week. KMSU is 89.7 FM in Mankato, 91.3 in Austin, and there's a "listen live" button on the website linked above. I'll be torturing the listeners at 1 p.m. on alternate Thursdays. Spring training went pretty well for the Twins. No significant injuries -- even the forearm tightness reported last week for prospect Nick Burdi is apparently sufficiently dissipated that he's throwing again -- no late PED suspensions a la Ervin Santana, plenty of exhibition game wins. The Red Sox are a popular pick to win the AL East, and the Twins beat them like a drum all month. Of course, that was spring training. That was March. Today the aforementioned Santana takes the mound against another AL East team the Twins racked up wins against in Florida, but this time it's in Baltimore and it counts. Spring training will be relegated to the scrapheap of memory. This week's Monday print column implies a fairly optimistic view of the 2016 Twins season, Byron Buxton and Byung Ho Park 1-2 in the Rookie of the Year voting? If they perform that well, the Twins ought to at least make the playoffs, right? Well, maybe. The fourth of the four predictions is a warning sign. All those strikeouts. I'm been writing at a distance about the Twins since 1989, and one of the long-time themes of my analysis has been what I call "the Kelly Virtues." What Tom Kelly demanded of his position players: Good defense, swing at fastball strikes, put the ball in play. Kelly's first team, the famous '87 Twins, had three 30-homer seasons and a fourth with 28; the Twins never had a 30-homer man again in Kelly's reign. TK's approach sacrificed power for batting average. In the peak of the steroid era, that was a bad trade. We are not in the steroid era any more. Today's defending World Series champs are the epitome of the Kelly Virtues. Today's Twins, at least at the plate, are not. There comes a point when strikeouts are not merely the exhaust of a power-hitting lineup, but indicative of a deeper problem. That point is certainly at a higher level that Kelly believed it to be two decades ago, but this lineup may be past that point. The Twins in 2014 had a productive offense. That production sagged last year; Minnesota scored 696 runs, 14 under the AL average and eighth in the 15-team league. Minnesota's on-base percentage (.305) was dead last in the AL. You need baserunners to score runs, and of the eight players listed by Baseball Reference as "regulars" for the 2015 Twins, only Miguel Sano, Joe Mauer and Aaron Hicks bettered the AL average in OBP. The 2016 Twins figure to get more at-bats from Sano, but Hicks is gone. And that is the crucial question for this team. There's power in this lineup. There's some speed. But will there be enough baserunners to make that power be more than a one-run offense? for tonight's season opener between 2015's World Series foes. I think that says it all, folks. Play Ball! has put the O's in a dilemma. Byung Ho Park, who figures to be the Twins' designated hitter, wasn't the only transferred Korean star testing himself in American baseball this spring on the Florida Gulf Coast. 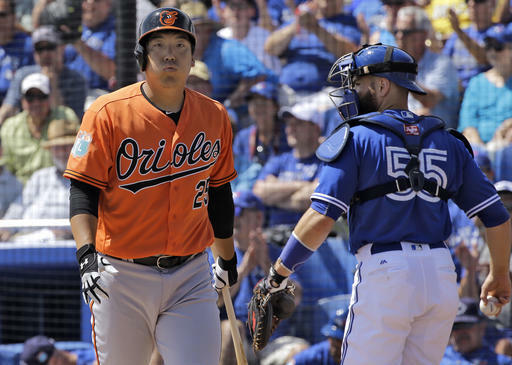 The Baltimore Orioles have outfielder Hyun Soo Kim, and he is at the center of an intriguing drama. Paul Molitor, the Twins manager, has said he has seen little indication in spring training that Park is overmatched against MLB pitching, which is a legitimate concern for a KBO transfer. The Korean Baseball Organization, the top league in South Korea, is not a particularly rigorous level of pro ball, and big hitting numbers are commonplace. Kim, on the other hand, struggled in exhibition play for the Orioles. He was hitless in his first 23 at-bats and slashed .182/.229/.182 in 44 plate appearances. He hasn't appeared in a game in a week, and the Orioles want to send him to the minors. The problem is: They are contractually forbidden to do so. Kim's two-year, $7 million deal guarantees him a spot on the 25-man roster. 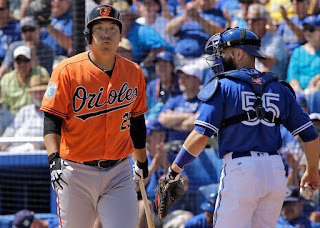 Reports this week had the Orioles asking the 28-year-old outfielder to waive that clause, and Kim declining to accommodate them. The O's face a noon Sunday deadline to set their roster for their Monday opener against the Twins, and it appears they will either have to carry a player the manager thinks he can't use or eat the entire contract and posting fee and release Kim. Neither choice is welcome. It's worth noting that Pittsburgh stuck with Jung Ho Kang last spring when the infielder hit .200/.280/.444 last spring and then hit .182/.208/.436 through April 28. The rest of the season he hit .293/.363/.474 and took on a regular role on the left side of the infield before suffering a leg fracture. Kang's experience had the Twins anticipating early struggles for Park in his transition to American ball. I don't know what the Orioles expected from Kim in March, but no power whatsoever probably wasn't it. Kang at least showed some pop in his transition period. Park slashed .273/.293/491 in his first 55 exhibition at-bats. I've seen conflicting reports on his contract status, but considering that Kim and Kang had no-demotion clauses, I would expect that Park's does as well. It hasn't been a issue. Nick Burdi, much-anticipated relief prospect for the Twins who made it deeper into major league camp than anticipated, will open the year on the disabled list with tightness in his forearm. This may or may not be the precursor to a more significant injury. But I can't help but remember that early in camp he was reported to be working on a split-finger fastball, and I was dubious of that idea in part because of the injury risk. I don't know if he continued to pursue the pitch; if I recall correctly, Terry Ryan said at the time that it was up to Burdi. Even if he was still working on it, connecting the pitch to this forearm issue is at best imprecise. Pitchers get hurt. Understand why Twins kept Arcia, but I prefer Mastroianni more as a bench piece. Does more things will than Arcia. Other than misspelling "well" as "will", I stand by that thought. Oswaldo Arcia has the advantage in power. Darin Mastroianni does everything else better. I don't know where Arcia's going to get his at-bats, and if he's not getting at-bats, he's no help. Last year Shane Robinson, who is kinda sorta the same player as Mastroianni, played in 83 games with almost 200 plate appearances for the Twins. Now, that was a team with a 40-year-old right fielder who needed plenty of days off, and this year's roster doesn't have that kind of issue. But it does have an outfielder who has minimal experience in the outer garden (Miguel Sano), and another who was once hit in the head by a fly ball in a major league game (Arcia). Robinson, incidentally, was released by Cleveland this week, where he was a non-roster invitee, and on Thursday signed with the Angels. Brian Duensing, non-roster invitee with the Kansas City Royals, was released this week. Anthony Swarzak, non-roster invitee with the New York Yankees, was reassigned to minor league camp. Blaine Boyer, non-roster invitee with the Milwaukee Brewers, made the major league roster.